We invite you to journey with us over a series of six short biblical reflections, with Mother Mary, in the lead up to Christmas when Jesus was born. Each reflection contemplates a specific event in Mary’s life, and is accompanied by a graphic and verses to help us in our personal reflection. Mother Mary is our model of gentleness, humility and meekness. She teaches us to be silent, to pray and to contemplate. She is our Lord’s Mother, and she is our Mother. May these reflections help us to walk with our gentle Mother, to entrust ourselves to her motherly care, and to inspire us to imitate the virtues of Mary, which are also the virtues of Christ. And as we learn from Mary, we realise that she brings us closer to herself, and to her Son Jesus. The angel Gabriel was sent to Mary, to tell her that she will bear a Son whom she will name Jesus. Mary was confused, because she did not know how it could be possible, since she was a virgin. She was afraid, because she would be judged and condemned by the Law and people around her. We may not always fully understand why or how things will work out, and we may sometimes worry about the difficulties that we may face in our journey ahead. 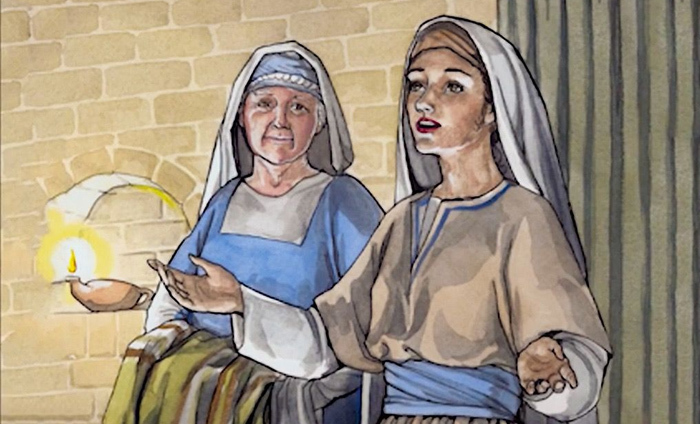 After hearing from the Angel Gabriel that her cousin Elizabeth was pregnant even in her old age, Mary made an arduous journey through the hills and valleys to visit her cousin. 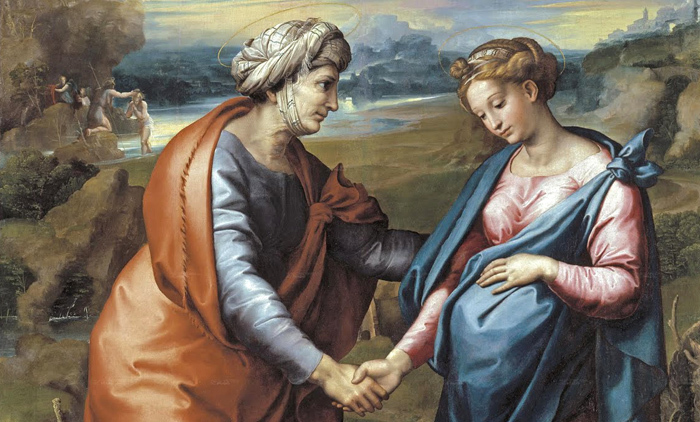 Elizabeth was already six months pregnant and Mary stayed for three more months, which meant Mary supported Elizabeth during the remainder of her pregnancy. Mary teaches us that even though we may have our own worries, or we may be busy with our own activities, we can still pay attention to the needs of people around us. Just as Mary helped Elizabeth in small ways, we can brighten the lives of others by running little errands, by offering a simple smile and greeting, or by just by spending time with them. In the Magnificat, Mary proclaimed the greatness of the Lord and said the Almighty had done great things for her. She did not exalt herself but recognised that God was working through his humble servant. Mary teaches that we should never become proud or exalt ourselves. Rather we must recognise that it is the Lord who has given us good things. She also teaches that if we are encountering difficulties in life, we can trust in the Lord to lift us up, reminding us to always stay humble and be grateful to God for His kindness towards us. 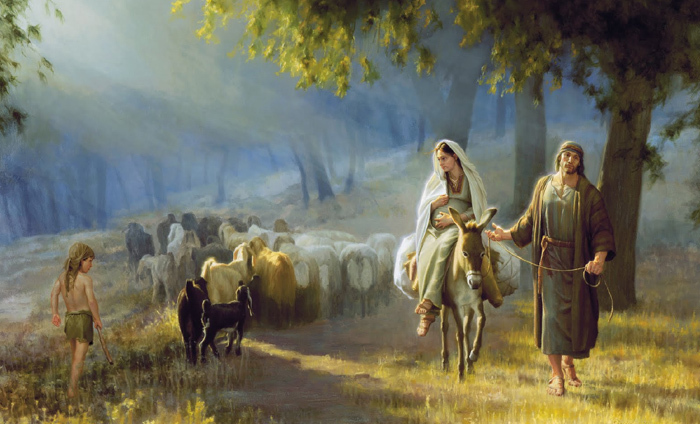 Since the Emperor had ordered a census to be taken, Mary, now heavily pregnant, has to make the arduous trip with her husband Joseph to Bethlehem for registration. When we are already burdened by worries, guilt or work, the last thing we want to hear are new edicts that add to our load. Yet Mary teaches us to humble ourselves, forget our ego, and learn to be meek, gentle, submissive and obedient. Let us not forget that just as God provided Mary with a loving husband, Joseph, on this difficult journey, God will also send people to walk with us through our many trials and tribulations. Mary was about to give birth and she was suffering from labour pains. However, Joseph and Mary could not find a proper room in the inn, and had to settle for a place where the farm animals lived. When Mary eventually gave birth, she wrapped baby Jesus in cloths and laid him in a manger, which is a trough or container used to hold food for animals. Mary shows we can be happy in a lowly place like the stable where Jesus was born, and there is no need for worldly riches or pleasures. The image of Mother Mary wrapping Jesus in swaddling cloths also reminds us that she is our loving and gentle Mother, and we are her little children. When Jesus was born, angels appeared to shepherds, singing praises to God, and telling them about the birth of the Holy Child. 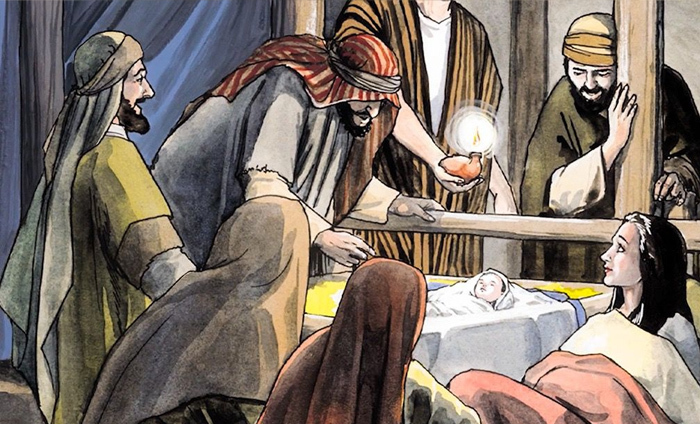 The shepherds went to Bethlehem, and found Joseph, Mary, with baby Jesus lying in the manger. 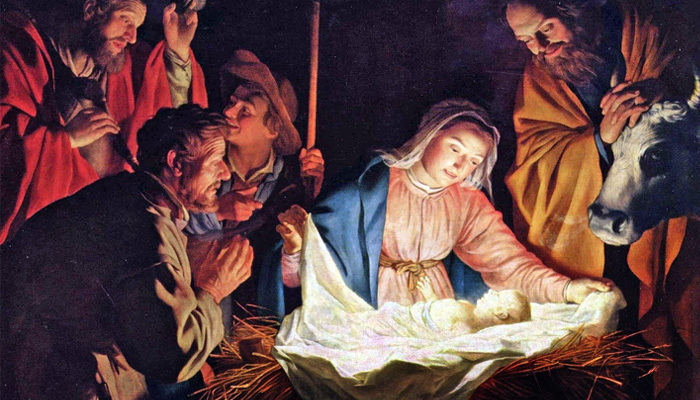 The shepherds could not hold their joy and told Joseph and Mary what the angels have said. Mary treasured these words in her heart, and pondered deeply about them. This is one aspect of Mary that often draws us to her. Mary doesn’t speak much and is prayerful and contemplative. She took note of what happened and pondered about them day and night. There’s a need for us to stay silent and humble, to pray, ponder and cling to Jesus and Mother Mary, and not get distracted by the many activities around us that may not be relevant. 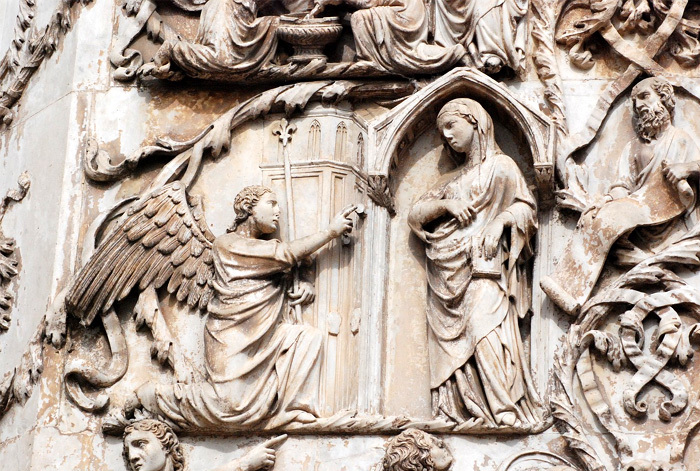 We hope you have enjoyed this 6-part series reflection on Mary this Advent! Here’s a story for an all-age Christmas service retelling the events of Luke2:8-20 from the point of view of the sheep! What a commotion there was out on the Bethlehem hillside that night! Bright lights, heavenly singing and that amazing message! God’s special rescuer had come. Everyone in those days knew that Messiah was coming one day, so these local shepherds realised straightaway that this message was important. History was coming to a huge turning point. This really was a special moment and they, mere shepherds, were the first to know about it! They would be first with the news – what a scoop! Can you imagine their excitement, amazement and joy? They were just nobodies – in fact more than likely just hired shepherds taking the night shift for someone else – but God had chosen to speak to them. Mind you, I don’t think it was by chance that God chose to go to shepherds first. Shepherds have always been very important to God and a shepherd had of course long been a picture of God’s character. So off they went to Bethlehem – running, dancing, tumbling and… leaving their sheep! It must have been important. Fancy leaving their livelihood behind – unheard of! And I wonder what the sheep thought of all this? Let’s use our imagination. Mary, the Virgin Mother of God and the Immaculate Conception, wants nothing more than to help us become as pure and holy as she is. lovest us, and dost procure our happiness. The second time in which Mary brought us forth to grace was when, on Calvary, she offered to the eternal Father, with so much sorrow of heart, the life of her beloved Son for our salvation. Wherefore, St. Augustine asserts, that, having then co-operated by her love with Christ in the birth of the faithful to the life of grace, she became also by this co-operation the spiritual mother of us all, who are members of our head, Jesus Christ. This is also the meaning of what is said of the blessed Virgin in the sacred Canticles: “They have made me the keeper in the vineyards; my vineyard I have not kept.” Mary, to save our souls, was willing to sacrifice the life of her Son, as William the Abbot remarks. And who was the soul of Mary, but her Jesus, Who was her life and all her love? Wherefore St. Simeon announced to her that her soul would one day be pierced by a sword of sorrow; which was the very spear that pierced the side of Jesus, Who was the soul of Mary. Mary is essentially a Mother. She was predestined from all eternity, included in the very decree of the Incarnation, to be the Mother of the Son of God made man. In that predestination is included not only her physical or biological maternity in relation to her Son, but also her spiritual maternity in regard to all the redeemed children of God, the disciples of her Son. We shall return to this point further on. All of God’s children, redeemed by Jesus’ blood, death and Resurrection, constitute the family of God which is the Church. Mary is thus, at the same time, Mother of the Church, of the people of God, of the pastors and the faithful. This title, Mary, Mother of the Church, was solemnly proclaimed by Pope Paul VI on November 21, 1964, at the closing ceremony of the third session of Vatican II.